This latest addition to our products and services is part of our promise to anticipate and meet the needs of our valued customers. We’re here to help with all of their identification, printing and workplace safety needs. Clarion Safety Systems, a leading designer and manufacturer of safety signs, safety labels and safety tags, has launched new Custom Printing tools, allowing for custom printing needs to be met quickly and easily online, whether it’s related to instructional messages, identification or asset management. With Clarion Safety’s new online custom printing tools, customers have an immediate way to create QR code labels, barcode labels, and serial number labels and send them straight to production. Custom QR Code Labels: Adding QR codes to labels is an effective way to offer quick access to further information, especially for ID and asset management needs. Clarion Safety’s customizable QR code labels allow customers to easily craft a label that is completely specific to their company’s work. Custom Barcode Labels: Barcode labels can help to create operating efficiencies, improve company organization, save time or money, manage item pricing or control inventory. Clarion Safety offers a wide selection of custom barcode labels that include UPC barcode labels, Code 128 barcode labels, EAN-13 (GTIN) barcode labels, Code 39 barcode labels, ITF-14 barcode labels, pharmacode barcode labels and MSI barcode labels. 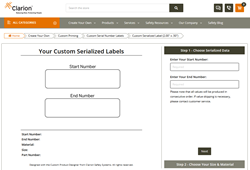 Custom Serial Number Labels: Serialization labels can help businesses track assets and the repair and warranty required on those products. Key information can be embedded in a serial number so customers and employees have quick access to things such as manuals and instructions. Clarion Safety’s online tool makes creating custom serial number labels simple with ready-to-use templates. Clarion Safety offers a variety of additional custom printing options including dataplates and nameplates, graphic overlays, asset tags and labels, tamper evident labels and certification labels. Contact Clarion Safety or visit the company’s website for additional information.